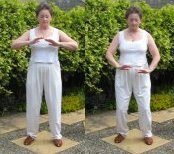 We have created some and bought the licence for other (which is why we ask you not to copy them..) qigong pictures to go with our posture pages and our step by step exercise instructions. Reading about qigong is one thing  seeing what the moves look like is another!. We found it just makes it a lot easier if you can get an overview of the overall sequence  without trying to understand the words as well. 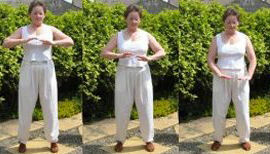 Even better is to watch the qigong video clips - because then you can see what the whole sequence looks likes. the full shibashi pattern in lots of pictures - so they are on 3 pages - just pick where you want to start. 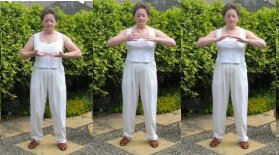 We have a lot of qigong exercises so we have tried to put them together in useful groups. If you have trouble with your back - choose something from the back section. Because we have grouped them this way you will see some of the exercises appearing in more than one group. Use them in your tai chi warm ups - or just because they are nice to do. These are all about getting yourself into the right frame of mind to start the exercises they mostly concentrate on relaxing the breathing and clearing out stale air and chi. These are about storing any excess chi that you have created during the qigong exercises so that you can leave the exercises calm and refreshed. Here we have lots of different exercises to strengthen and help your back. This one is just a sample!..